"A swollen dog paw is the result of any one of a number of things that dogs get up to and into, ranging from an insect bite to a broken toe. Causes of paw irritation include irritation after walking on gravel, allergies to grasses, broken nails, wounds, spider, wasp, bee stings, snake bites or a broken toe. The key is to differentiate between an injury where you should see your vet or one that you may manage at home. Some quick treatments for a dog with paw swelling includes aspirin (1 adult aspirin for 30 pounds), benedryl (25mg for small dog, more for a larger dog), neosporin ointment or cortisone ointment to take down the swelling and pain. Wounds and other problems could cause the dog to lick the paws, causing them to lick the feet raw. Itch from allergy will also cause them to lick the feet in an attempt to relieve any itch." Digging, running, jumping, crawling, exploring, tripping or stepping on something such as a sharp rock, nail, glass or even a bee or other stinging insect can result in dog paw swelling. It’s a busy life when you’re a dog with so many things to see and do and places to go. While many a swollen dog paw is the result of a minor injury, and will likely not require a trip to the vet, you do need to know some basic first aid skills if you need them. The first thing you need to know about a swollen dog paw is how to assess whether or not you are dealing with something serious. This isn’t as difficult as it may sound. Simply start by observing how your dog reacts to the injury. Different reactions will indicate to you what you may be dealing with. For instance, if you try to touch the injured paw and your dog yelps in pain and won’t walk on it, you might want to get x-rays done to check for a fracture or break. On the other hand, let’s say your dog tries to bear weight, but is limping. This is likely “not” a broken toe or foot, but may be a strain or sprain. You can certainly treat sprains and strains at home with ice packs, Reiki (if you are trained in this form of energy healing, because it reduces swelling) and rest. Some people think it’s a good idea to give your dog aspirin. Honestly, we suggest you do not. Here is why. If they are in pain, they will stay off their foot and help themselves heal. If they are on drugs that stop the pain entirely, they run the risk of making their injuries worse. Ask the vet for a middle of the road dose; one that helps dull the pain, but does not completely stop it, unless the injury is so severe that your dog needs a healthy dose of painkillers to even rest comfortably. Just remember, that if you get a certain dose of aspirin, or something else prescribed, “only” use the dose as recommended, and “not” more. More is not better, and may seriously harm or kill your dog. Typically, for a swollen dog paw, a canine patient is prescribed a dose of 5 to 10 mg per pound, 2x per day. Note that children's aspirin is 81 mg. (check the label). Only use after checking with your veterinarian. Your vet is in the best position to judge the length of treatment and dosage requirements for your dog. Typically, you will feel the swelling in the paw, see your dog limping, yelping, holding it in the air, not walking on it or licking or worrying the paw, by biting or nipping at it. It’s not always easy to see swelling on black pads. If your dog has pink pads, you may be able to detect swelling faster. 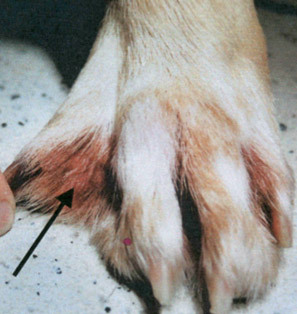 On pink pads, you may also see redness that may accompany swelling, depending on the cause of the swollen dog paw. 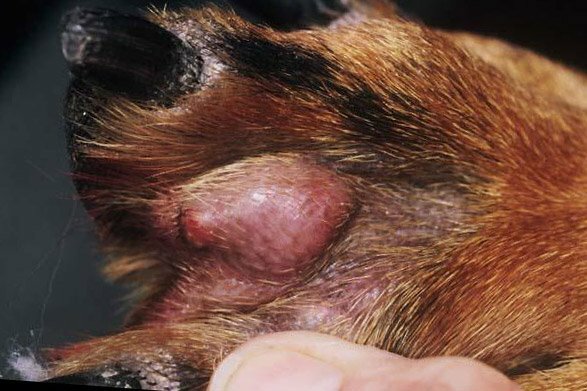 A swollen dog paw alone, if it is the result of a sting or other bug bite, typically subsides in about 24 hours. There is usually no infection to detect. 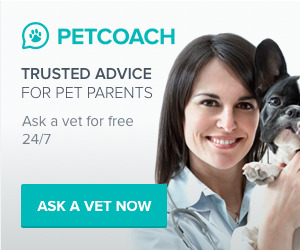 If however there is infection, pus, tissue necrosis (dead tissue), and the paw just doesn’t look right, it’s a good idea to call your vet for help. On the other hand, if there is a puncture wound in your dog’s paw, as the result of stepping on a sharp object or even being bitten by another dog, this type of a wound does tend to get infected. If you are able to wash the wound thoroughly and carefully apply hydrogen peroxide to disinfect it; that is a good start to keeping infection at bay. Monitor the paw carefully and call your vet if you see something that doesn’t look right. Untreated infections can spread like wildfire. Your veterinarian just needs to look at your dogs pad to see if there is a problem and what that may be. If you already have an idea of what happened, it is a good idea to let the vet know right away so they can determine what might be needed to help your dog. For example: if your dog stepped on a rusty nail, the vet may wish to administer a tetanus shot. Or if your dog stepped on glass, it may need to be extracted. If your dog was in a fight and got bitten, s/he may well need stitches and antibiotics, based on what the swollen paw diagnosis happens to be. There are a number of treatments you may try, depending on the type of injury sustained by your dog. More minimal injuries, try thoroughly cleaning the visible wound with warm, soapy water and/or hydrogen peroxide. Dry thoroughly and apply something like Polysporin, Aloe Vera cream or gel, or other antiseptic cream. Cover with a baby sock and vet wrap, to keep your dog from chewing it off. Some people prefer to soak the paw with warm water and Epsom salts. This works well, but does need to be done three times a day for the first few days to ensure there is no infection. If, after about three days or so, you don’t see any improvement, your dog should see the vet and have the paw checked. If you are dealing with stings or bugs bites, you may try cold compresses or ice packs. Five minutes on and five minutes off, at least twice an hour. This may be a challenge, as most dogs don’t like this. Don’t apply this compress/ice pack directly to their pad, instead, provide a thin barrier to prevent a freeze burn. If they are in enough pain, they may oblige and sit still for at least three minutes. If that is all you can get them to sit for, that’s good enough. You’re aiming for a reduction in swelling and anything longer than a minute will help. If the injury appears to be a sprain or strain, some people recommend using cold packs and following them with hot packs. Personally speaking, if you are dealing with inflammation, meaning swelling, you don’t want to put heat on it. Ice it. It you are dealing with tight muscles, meaning there isn’t always a lot of swelling, heat usually helps loosen them up. You just need to know which route to take before maybe making things worse. Also, light massage of the injured paw may help, if your dog will tolerate it. If your dog has been badly bitten by another dog on the paw or appears to have a broken toe or foot, there is not much you can do to treat this at home, other than rest and pain medications. 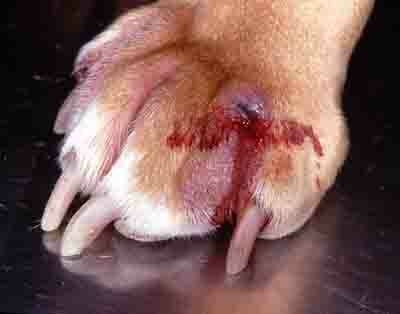 For this type of injury, you really need to see your vet, as the dog may require surgery or even a cast or splint. Dogs recover well from this type of treatment. Repairs such as ligament tears are more complicated and difficult to perform. 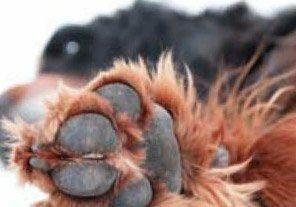 Dog Paw Pad's Should be kept Clean To Avoid Problems related to Debris that Get Caught in the Inter digital hair (hair between the pads). Hair between the pads tends to mat, making it uncomfortable when the dog walks. 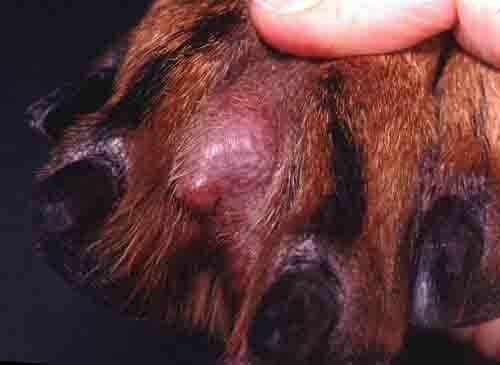 Inter digital cysts in the form of nodules or lumps can form in between the paw pads. One type, cutaneous horns are formed with hard tissue that are 1/2" to 2" in size. These growths need to be surgically removed.